Shes not the stereotypical stoner, zoned out in a haze of smoke and flunking out of school. Emma is a graduate of Palmer High School in Colorado Springs, known for its prestigious International Baccalaureate program and for attracting a diverse student body. But Palmer holds another distinction and so does Emma, whose name has been changed to protect her identity. The downtown Springs school posted one of the highest increases in drug violations reported by any Colorado school in the past four years. In 2007-08, Palmer reported two drug violations; in 2010-11, it was 45. And Emma, now a successful college student mulling a career in law, is also a regular user of medical marijuana who frequently got high in Palmers party parking lot during lunch or other breaks from school. Its a lot of fun. You go out to your car, get high and go back, she said. We werent worried about getting busted. Although shes old enough at 19 to seek an M card, a state-issued license for medical marijuana, Emma hasnt done so. She thinks its intellectually dishonest to fabricate an illness to buy marijuana. The term medical isnt fooling anyone, she said. I dont think most of the people who have their cards think of it as medicine. But most young people dont get medical marijuana directly from the dispensaries anyway, she said. Instead, they get an older friend or sibling to buy for them or they get it straight from licensed growers with extra product. They are growing so much marijuana legally that they will go out and find other people to sell it. Thats where the kickback is, she said. Connecting with a dealer is simple. They find you, she said. If youre downtown and trying to solicit somebody to buy cigarettes outside a gas station, its safe to assume you also smoke pot. Perhaps the easiest way to buy is through an older friend or sibling. Certain dispensaries have coupons where you can get two ounces for the price of one, she said. If a kid can search through High Times magazine and find a coupon, then you find a friend who can cash it in. She described her high school friends who smoked as discriminating shoppers who searched for bargain prices on medical marijuana because its generally less expensive, higher quality and perceived to be safer than street pot. INEWS011-Judy Negley, left, co-owner of Indispensary, a medical marijuana dispensary in Colorado Springs, talks to manager Christy Kress. The U.S.Judy Negley, left, a co-owner of the Indispensary in Colorado Springs, received a letter from federal officials ordering her to move or close her dispensary near Palmer High School in downtown Colorado Springs. Photo by Joe Mahoney – I-News Network. One thing they didnt do, Emma said, was walk in to a dispensary near Palmer. She mapped them for a school project last year, but said the dispensaries wont sell to kids and too many people would see a teen loitering outside. An investigation by Education News Colorado, Solutions and the I-News Network found as many as eight dispensaries are located within a mile of Palmer. One, called Indispensary, is kitty-corner from the schools front door, separated by a small park. Indispensary co-owner Judy Negley said hers was among the 23 medical marijuana facilities located within 1,000 feet of a school that were recently targeted in a federal crackdown. 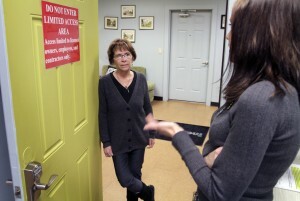 Negley said her shop doesnt sell to anyone under 18 without a state-issued marijuana card. Statewide, fewer than 50 cards have been issued to youth that age. Students without cards have zero access to their product, she said. It would be so difficult for them to get in. They could break in, she said. But in our dispensary, they have to go through two locked doors. Theres surveillance everywhere. They have to present credentials in a neutral area. I dont think dispensaries are the problem, Negley added. The kids are smart enough to know that. Emma and other students interviewed said they dont believe the proximity of dispensaries to schools has made marijuana easier to buy. I havent heard of a single dispensary anywhere selling to somebody without a card, she said. The kids who are smoking weed and getting high at Palmer are not getting it from the dispensaries. So what do students like Emma think policymakers should do about the spike in drug violations at schools? Regardless of the legality of pot, we will continue to smoke it, she said. I dont think people see it as positive or as medicine. Its still a drug. People do it more to get high but its viewed as safer than the alternatives.